Condition: AAA, repaired tear at top edge outside of plate. 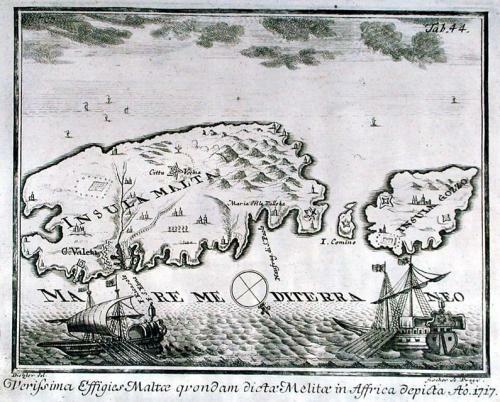 A rare engraving of the islands of Malta and Gozzo. The oldest megaliths in the world are located on the islands. Archeologists have dated the stone structures of Ggantija (the Giant's Tower), Hagar Qim, Tarxien, and Mnajdra to about 5200 BCE. The first settlers arrived on Malta and Gozo around 5000 BCE from Sicily. The growing threat of the Ottoman Turks to western Europe caused Charles V, Holy Roman Emperor and King of Spain, to give Malta to the Knights of the Order of St. John of Jerusalem in 1530, for a yearly rent of a Maltese falcon. From a book by A M Myller recounting his travels from 1725 to 1727. Myller journeyed from Rome to Jerusalem then on to Troy, Gallipoli and Constantinople. From Constantinople he travelled to Egypt and then to Syria. Finally from Syria he travelled to Malta and back to Rome.